Stamped concrete is awesome. Stamped concrete is one of those home remodeling trends that seems to be catching fire lately, and for good reason. I've seen stamped concrete for years, and wasn't much impressed by it. Only expensive commercial applications looked decent, and even that was a stretch. Recently, though, new texturizing and pigmenting trends allow homeowners to introduce stamped concrete to their exteriors. Brick, pavers, and cobbles look great, but since they form a surface of many interlocking pieces, they are susceptible to frost-heave and other changes in the underlying surface. Sometimes this can be good, if you're trying to cover an uneven surface--the brick, pavers, stone, or pavers will conform to the surface. But if you have a good, flat, and level under-surface, you'll want your concrete to be laid the same way. Reinforcing rods within the stamped concrete help to tie the pavement together and strengthen it. Also, bricks, pavers, cobbles, etc. allow for weed to grow up through the cracks. Since stamped concrete is a solid, continuous surface, nothing can grow up through the "cracks." As you may already know, the "cracks" in stamped concrete are simply impressions in the concrete that only partially go through the surface. Does Stamped Concrete Look as Good as Brick, Pavers, Cobbles, etc? It's all in the eye of the beholder, but in my view it does not. Aesthetically, it's a close second. I have seen stamped concrete that attempts to duplicate the look of exterior wood plank flooring. It looks great on its own terms, but it can never be mistaken for the real thing. As such, you may want to choose stamped concrete that isn't trying so hard to duplicate something else. 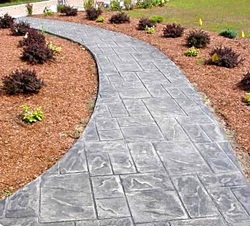 Stamped concrete can have any number of patterns, textures, and colors.